You know it's true. Just look at my poor track record. There are many reasons/excuses for this - though most of them boil down to sheer and simple laziness on my part. Also my fickleness. I start a lot of projects, and have great ideas for projects (at least I think they're great) but either lose interest or get distracted by the next "great" project idea. I have a pile of discarded or otherwise incomplete projects in my craft room. You've probably seen an older picture of it. It's grown, I assure you. Occasionally I actually finish something. Please meet Mr. Fox. He's quite handsome, isn't he? Plenty of character and he makes a great book guardian! Wouldn't his creation have made a fun blog post? Yes! But of course I forgot to take pictures until he was finished - and this was a months-long saga of a project once you factor in the fact that I could not find a doll needle anywhere in Halifax and that my sewing machine died (more on that in another post ha ha ha). Once I realized how close I had come to having something fun to blog about, I debated staging some photos of the fabric, the pattern sheets, etc. I didn't. Ultimately I decided that I didn't want to set a precedent for cheating, because you know once I went down that path I would be staging all sorts of things. Probably making up entire projects, even. At least I would get more blog posts done! 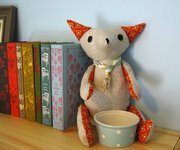 Anyway, here's one more picture of Mr. Fox in his completed glory. 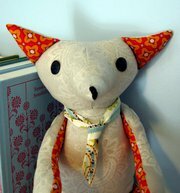 If you want to make your own Semi-Fantastic Mr. Fox, you can acquire the pattern from the Bird and Little Bird Etsy shop. He wasn't difficult to make, once I had all the supplies. Also, apparently these photos turned out all cruddy? Apologies for that.